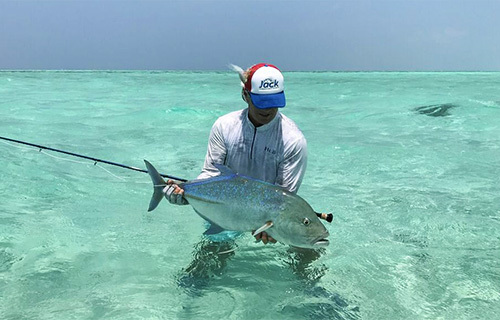 The Maldives Islands at the Indian Ocean offer an uncounted number of fishing location and the variety of sport fishing species to chase with a fly gear or conventional tackle, fishing from the skiffs or wading at the pancake flats in 1 to 3 feet of clear water. 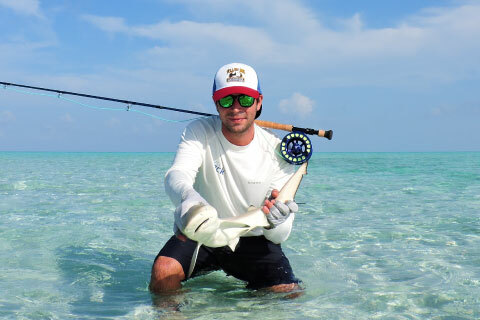 Maldives: a unique fly fishing destination in the world. Usually the fishing day begins at sunrise 6:30 am, with an espresso, cappuccino, tea, tropical juice of your choice & buffet breakfast and then ready to go. From 7:30am our English speaking guides will be ready to departure with our Hewes Redfisher 18F loaded with soft drinks, waters, snacks & lunch for the day. After boarding up, 25 to 45 minutes from departure depending on the fishing day or type of species that will be chase, will arrive to the fishery. 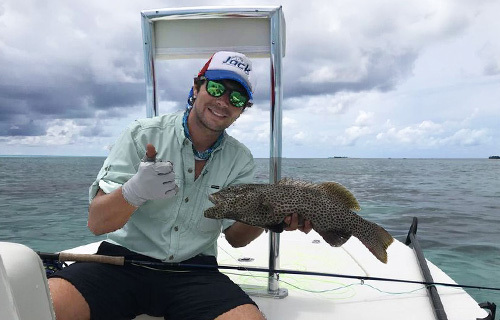 GT´s, Juvenile Trevally, Bluefin Trevally, Golden Trevally, Bonefish, Permit, Milkfish, many types of Trigger Fish, Groupers, Snapper, Barracuda and many other species in miles & miles of sandy flats. Fishing from our boats make easier & confortable but there will be many opportunities to disembark so make sure to bring your boots. 12, 10, 9 & 8 W Rods will be use through your week depending on the species, always, is important to have all set and ready to assure great fishing, floating lines are usually the call of the day but will be occasion that need to use intermedian & full sinking lines. 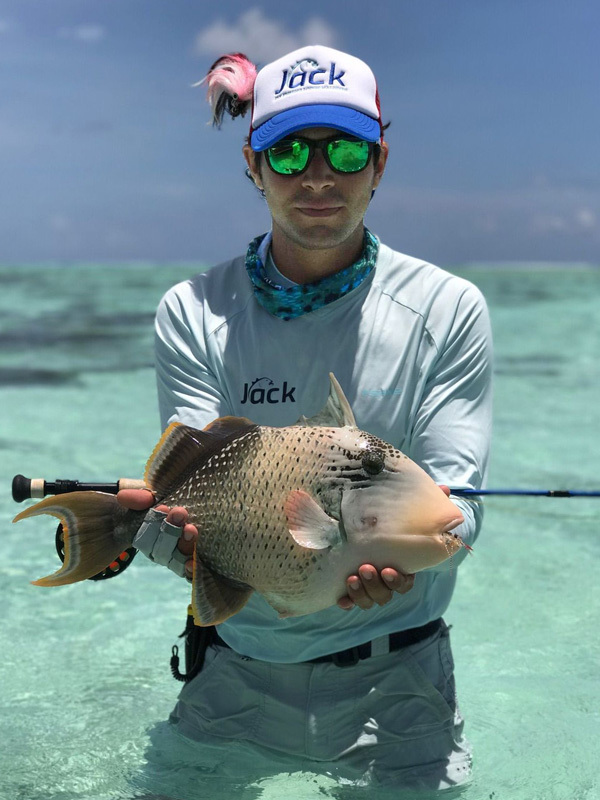 Triggerfish, Permit, Bonefish, Golden Trevally & BlueFin Trevally, Flies & hook: the lighter colored crabs seem more popular but pick according to the crabs in the Maldives, Fishient Spawning Shrimp – tan, James Sand Prawn – various colors, Fishient Crab – various colors, Rolling Bead Fishient Crab, EP Soft Shell sand Crabs- various colors, EP Descendent Crabs- – various colors, EP Permit Crab Golden sand, EP Ascension bay Ghost, The Bonefish Squimp & many others. 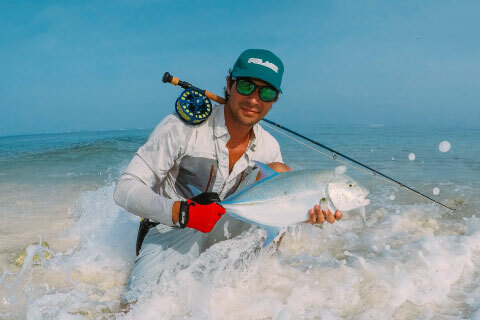 Giant Trevally, BlueFin, Snapper, Grouper and Sailfish Flies & hook: NYAP Popper-various colors, EP Boca Grande– various colors, EP Mullet– various colors, Polar Fiber Brush flies– various colors, Sculpted Bait Fish– various colors & Deceivers sardine type of flies in various colors. 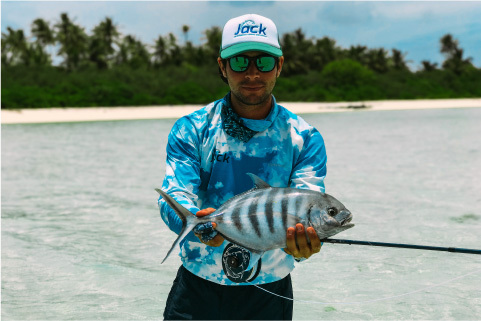 Other than the flies patterns & if you are a Fly tie enthusiast we really recommend to use Gamakatsu SL12S (99518-4) Hooks from Size 1/0 to 3/0 for Juvenile, Blue Fin Trevally and 5/0 to 9/0 for Giant Trevally, and bigger fish. 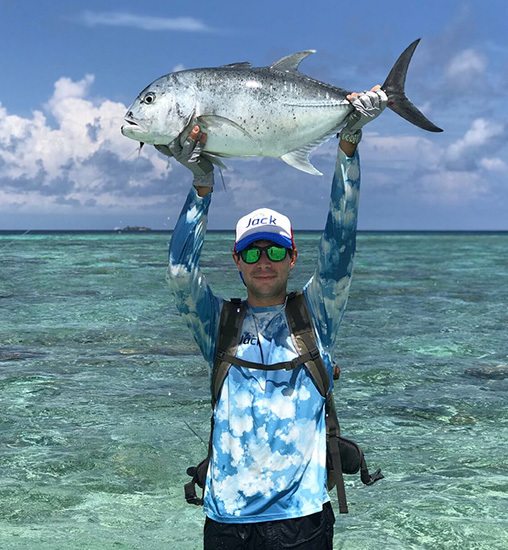 18 to 20 pounds Leaders for Permit, Triggerfish, Golden trevally & Bonefish, 30 to 60 pounds: Bluefin Trevally, Juvenile Trevally & all the way up to 110 pounds will be need it for the majesty the Giant Trevally. 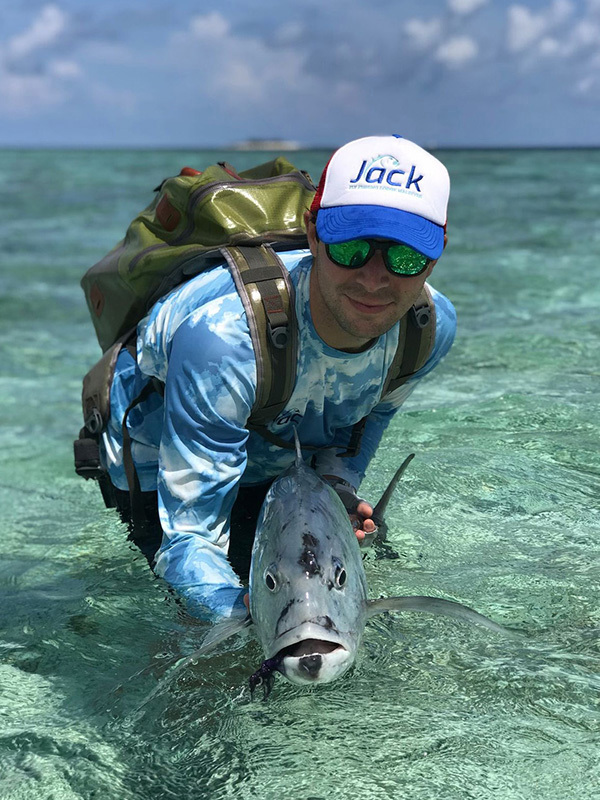 At the Jack Fly Fishing Lodge Maldives FLY SHOP have a great selections of Flies, Hooks, Leaders, Fly Lines, Backing, Hats, Gloves, Finger guards, Fishing shirts, Sun block, Sunglasses, Face masks & other necessary gear that you may need at your stay. Diversity gives anglers the opportunity to target almost all the species daily depending on the area, our borne and rise local guides are impatient to share their experience & passion for this unique fishery. If by any reason our guest requires gear we count with Sage Rods & Reels ready for their use. In order to maximize your trip you will need to be prepared, got to remember that we are in an island, in a secluded location with not easy access to some idioms. Do not worry, JFFLM FLY SHOP have all the necessary gear that you may need for your trip. Fly Rods and Reels, 12, 10, 9 & 8 W.